TV COVERAGE: BTN. Wayne Larrivee and Tim McCormick will call the action. 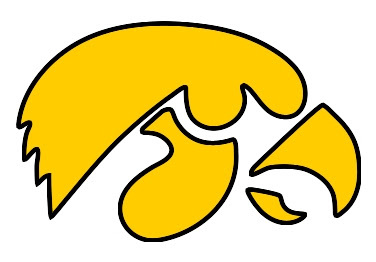 LINE - Iowa is a 1 point underdog at home. Iowa looks like a very capable team with Jake Kelly at the point. He is averaging over 20 points per game his last three games, this after having never eclipsed the 20 point in his collegiate career. Jarryd Cole continues to impress me with his attitude, hard work, and spark he provides the team. It's clear we won't see a 100% Cyrus Tate ever don the black and gold again for Iowa, but he's giving his all on the court. At one point in the first half, after picking up his third foul, Lickliter was about to sub in for him. Tate looked back at the bench and said something along the lines of, "Don't take me out. I'm not going to foul." Lickliter went with his captain's advice and Tate finished out the roughly 2 minutes of the half without committing a foul. It sounds as if Peterson will suit, but not be available tonight again. Iowa misses his handle, but as previously mentioned, Jake Kelly has done more than an admirable job in his absence. Ohio State is 3-6 on the road, and Iowa is 12-3 at home (losses all to Top 25 teams). The Buckeyes have lost 4 out of 5 and have effectively played themselves off the bubble for the NCAA tourney. Iowa will likely have issues containing Ohio State's bigs in this one, but I think Tate and Cole can do a lot of damage control down low. The Hawks are going to need to rebound tonight. Hlas writes that there are postseason ramifications for this game. While I agree on that Iowa has a shot at postseason, I think the Hawkeyes are already sitting very pretty to get to the postseason. Iowa has the best Pomeroy rating of any team in the nation at or below .500 (and better than quite a few teams above .500). They are right around the 80 mark, which arguably means at this time of the season Iowa is one of the top 80 teams in the nation. NIT is likely out, but either of the two other tourney would love to get Iowa. Back to the game at hand - KenPom gives Iowa a 50% chance to win this game. TODAY'S PROJECTED HAWKEYE KILLER: Jon Diebler. You can be sure that Jake Kelly is going to take Evan Turner, so that leaves likely Bawinkle on Diebler. Not good. It was not good to the tune of 27 points last time out vs. Iowa. Hopefully Lick sticks Gatens on Diebler. I like Iowa in this one even if we only get 10K inside Carver.